← Alicia Dean’s 1920’s Vintage Romance ~ RUINED ~ Free through Monday, March 21st! He watched her through the grey mist, walking along the shore of Cromarty Firth. The hood of her arisaid covered her bonnie russet locks, but he imagined them bouncing with each step she took. She came every morn, sometimes with the wee curly-headed laddie in tow, but now, she walked alone. His heart beat a fast rhythm like a lad watching his first love. How foolish to be hiding behind a rock when he could speak to her, hold her hand, and look into her dark eyes. Gavin gathered courage and stood to his full height when Flora walked past the rock where he hid. “Flora,” he said in a quiet voice. She continued to walk, not hearing him above the moaning wind. Quickly, he took a place beside her, then grabbed her arm. She screamed as she turned to face him. Her eyes widened with fear, she tried to jerk her arm free, then beat his chest with the fist of the other hand, and kicked his shin with the toe of a pointed boot. Gavin jumped from the boot’s path, but kept her arm secure. “Stop. ‘Tis I, Gavin.” She stopped kicking and the free hand went to her mouth while she studied his face. A small squeak emerged from between full red lips. He watched her lips for a moment, then bent to place a kiss on the inviting mouth. She became rigid with no response. Since elementary school I’ve had a desire to write stories, but a family and career took precedence over my ambitions to be a writer. After retirement, I became interested in genealogy and followed my family line to Scotland. Stories about the ancient Scots stirred my interest. 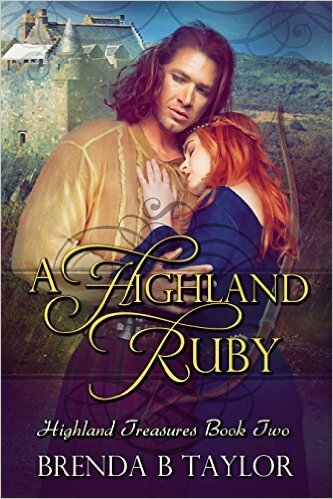 A Highland Ruby is a result of research into my Scots heritage and Scotland’s history. My favorite genres to read are historical romance and historical fiction. History is one of my teaching fields, and I enjoy reading stories set in the past. What are you working on at the moment, and what will we see from you in coming months? I am working on a novella prequel to A Highland Pearl, the first book in the Highland Treasures series. The novella tells the story of the love between Andrew’s and Gavin’s parents, Aine and William Munro. Thank you for joining me today, Brenda. I enjoyed getting to know about you and your book! I love historical fiction and especially those involving the Scots (I am Scots-Irish and proud of it!) We also share a fave character in Lizzie Bennet. Jane Austen is my hero! Good luck with all your projects from another retired teacher-writer. Thanks so much for visiting, Cory. When I began writing, I called it a hobby and found it is a demanding job, but one I enjoy. Thanks for hosting me on your lovely blog, Alicia. Thanks for stopping by, Melissa. I enjoy doing interviews. I loved reading this, Beth. Your stories are wonderful! I’m so glad you enjoy my stories, Marilyn. I so enjoy writing them. Wow…great blurb and excerpt. Sounds like another book to add to my list. Thanks Pam. I love meeting new friends. I always find the Highland stories fascinating as I don’t know that much about Scottish history. Thanks for sharing! Thank you for visiting M. J. Writing Scottish historical romances is my passion.